The Greek desserts and sweets are popular all over world as they are delicious and most of them, really healthy. They are made of traditional Greek products and their main ingredients are basic ingredients of the Mediterranean cuisine! 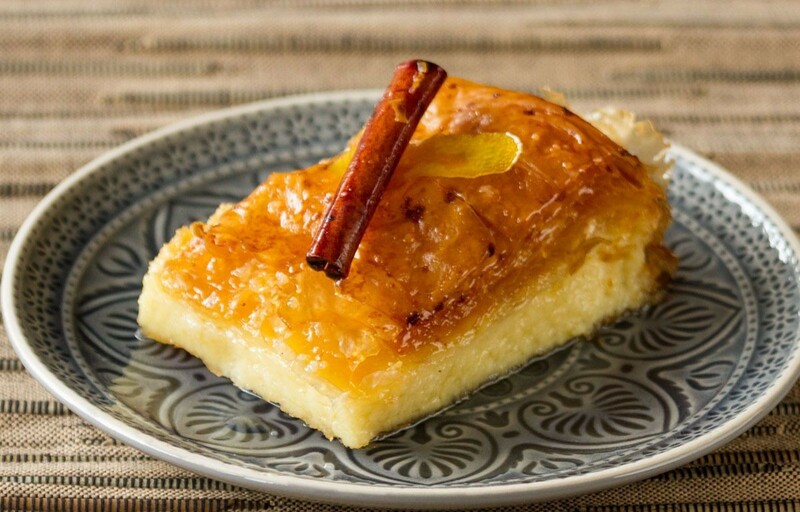 You will be certainly served some of the following Greek desserts and sweets at a tavern, after a delicious meal, accompanied with a shot of raki or tsipouro, two of the top Greek drinks! Alternatively, you may find them in pastry shops or shops selling traditional local products! Hungry for Holidays? Check out our great collection of Holiday Homes in Greece! It is a pie made of pastry, usually filled with cream or cheese. It can be filled with other ingredients also, such as minced meat, spinach or cocoa cream. The Minor Asian refugees brought it in Greece after the Asia Minor disaster, making it particularly popular in Northern Greece, especially in Serres and Thessaloniki. In Northern Greece, you will usually find it with cream, while in southern Greece with cheese. It may remind you of a cheese pie, but it is not the same recipe. It is served cut into bite-sized pieces, sprinkled with powdered sugar and / or cinnamon. 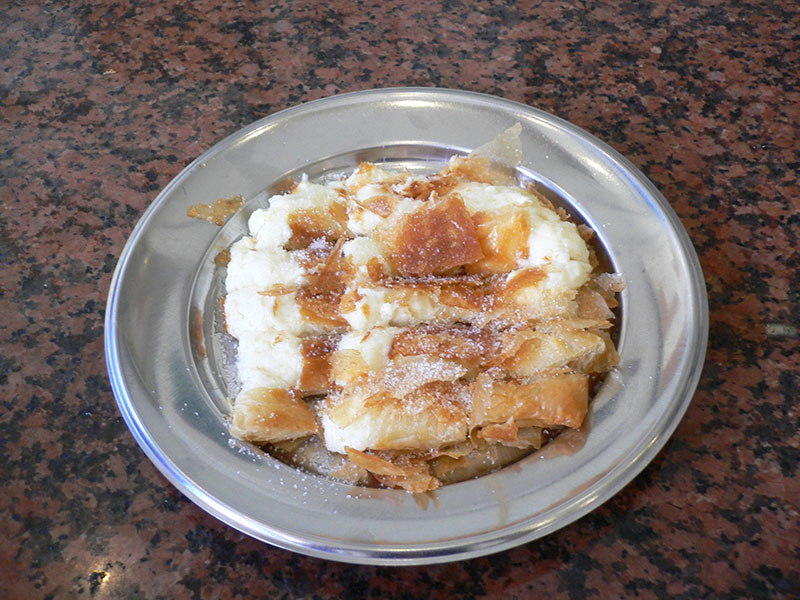 Díples is a Greek dessert with main ingredient to be its thin dough. 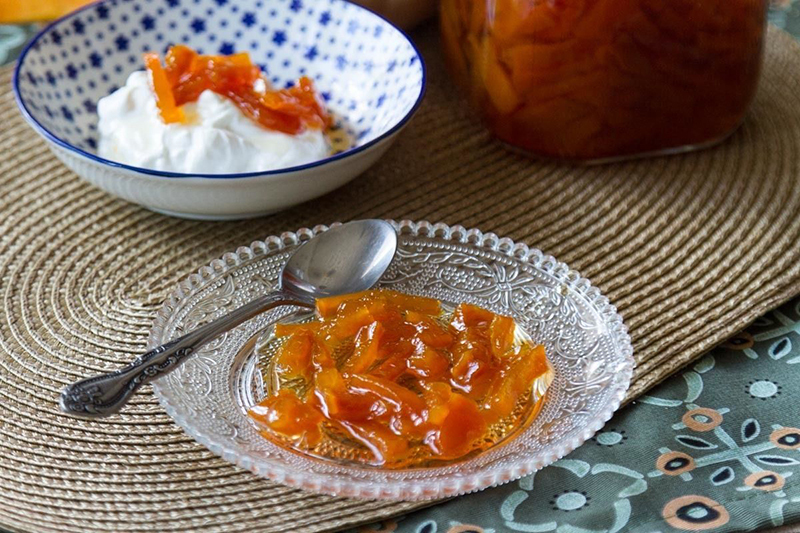 It is believed that this sweet comes from Peloponnese. 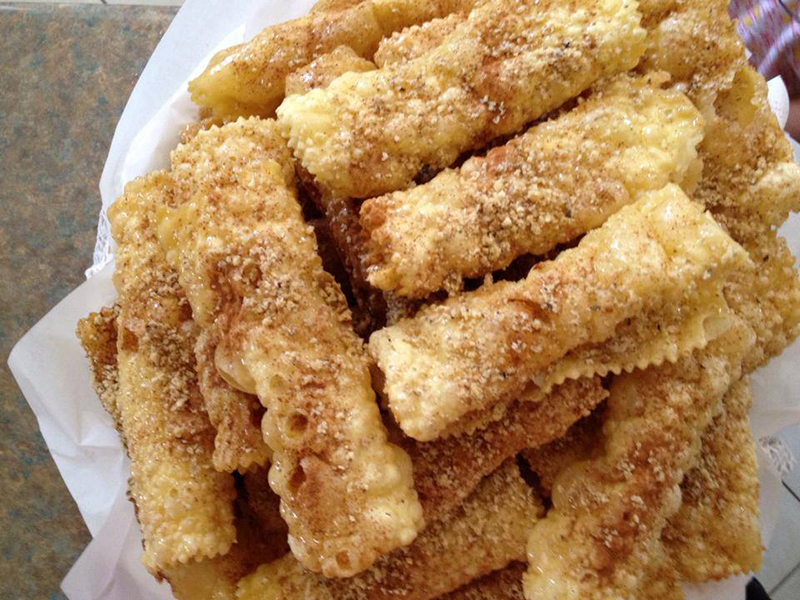 The dough is folded in various shapes, fried in hot oil and finally soaked in syrup. Traditionally, honey is used instead of syrup and díples are flavored with cinnamon and chopped walnuts. Díples can be made in different shapes, but the most common are spirals, bows and flowers. They are usually served at wedding occasions and New Year. The basic ingredients of the traditional homemade halvah is semolina, butter (or oil), sugar syrup and water. For variety in flavors or as decoration usually added various nuts (especially almonds, raisins), flavored with spices (vanilla, cloves, cinnamon, cardamom, saffron), honey, cocoa or chocolate, zest sour fruits and / or pieces of them, fruit juices or other natural flavoring preparations. Melomakárona are small honey cakes. They are Greek pastries made basically of flour, meal, oil, orange juice and honey. 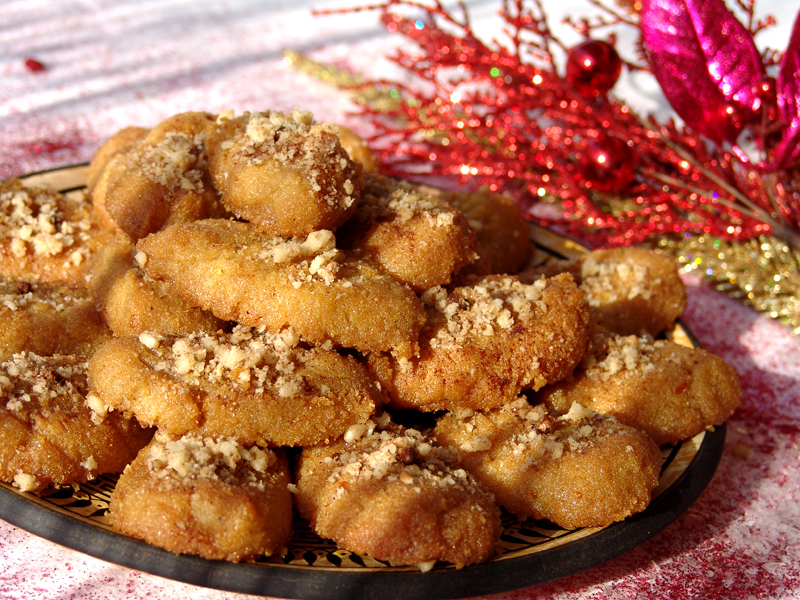 Along with the buns, melomakárona are considered essential in every home in Greece, especially during Christmas period. Typical ingredients of melomakarona are flour and meal, sugar, zest or orange juice, brandy, cinnamon and other flavorings, oil, honey and water. The sugared buns are typical sweets, very popular throughout Greece. Just like “melomakárona”, they are usually prepared in Christmas period. The name comes from the Turkish “Kurabiye”, which means biscuit, pastry flour, butter and powdered sugar. Asia Minor refugees brought the sugared buns from Karvali of Cappadocia in Greece, in 1924. So today in Greece the most known traditional buns are those of Karvali. 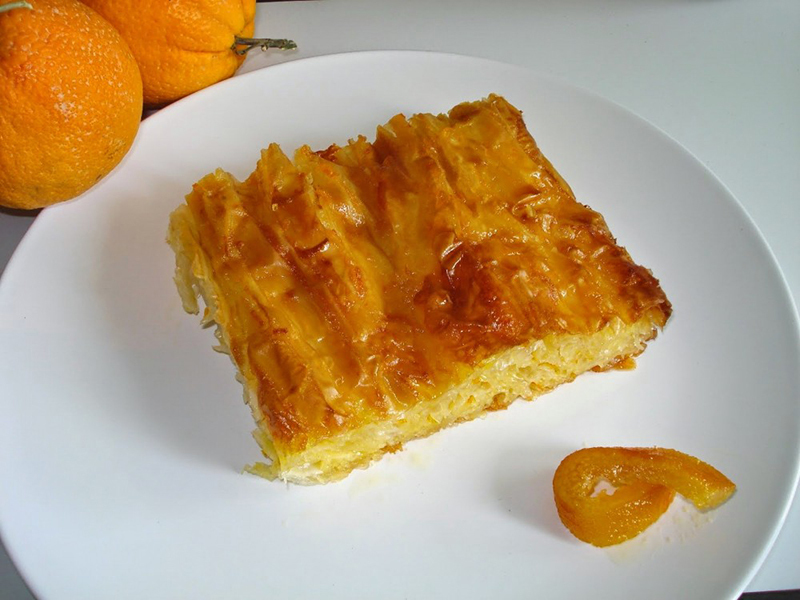 The orange pie is one of the favorite Greek traditional desserts, which is served very often in taverns, accompanied with raki. It is really simple and you may not be impressed at first sight, especially if you are a chocolate lover. However, if you taste it, it is sure that you will be left speechless! It is a fluffy, juicy and full of aromas sweet, made with crust sheet and yogurt and drizzled with viscous orange syrup. Orange pie is usually served with a ball of ice cream. 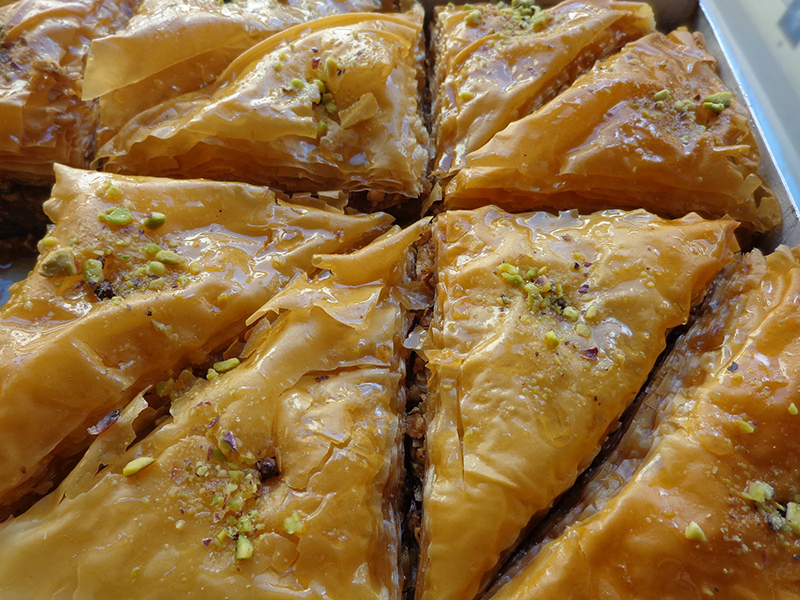 The baklava is a dessert that is found in many cuisines of the Middle East and the former Ottoman countries. However, it has also become a landmark of Greek pastry making. 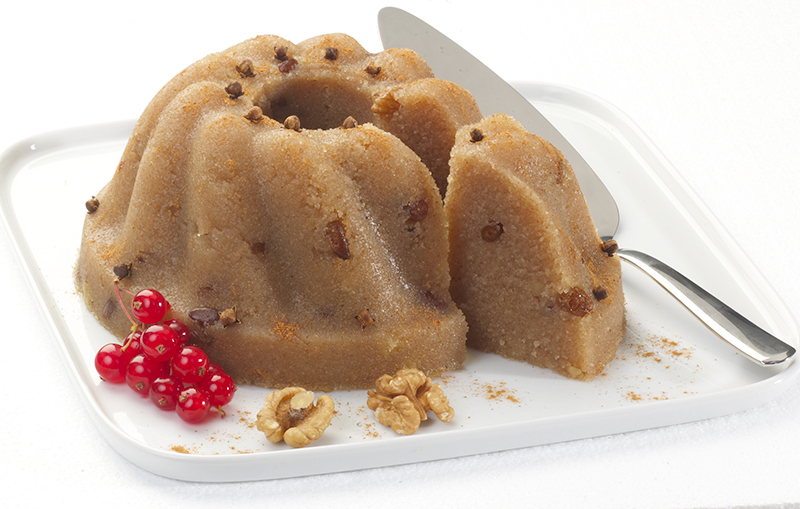 It is a dessert made with dough sheets, filled with nuts, usually hazelnuts, peanuts or walnuts. It has a strong sweet taste because of the honey syrup that it is drizzled with. It is usually served after a meal and it is perfect to accompany your Greek coffee. The custard filled pastry, galaktompoúreko, is one of the most popular Greek traditional desserts and sweets, which you may find in any pastry shop in Greece. It is a traditional syrupy sweet, consisting of pastry sheets and cream. There are different recipes and preparation methods for galaktompoúreko. The cream may have lemon or vanilla scent, and the syrup is made of sugar and water. Spoon sweets are representative of the Greek desserts and sweets. 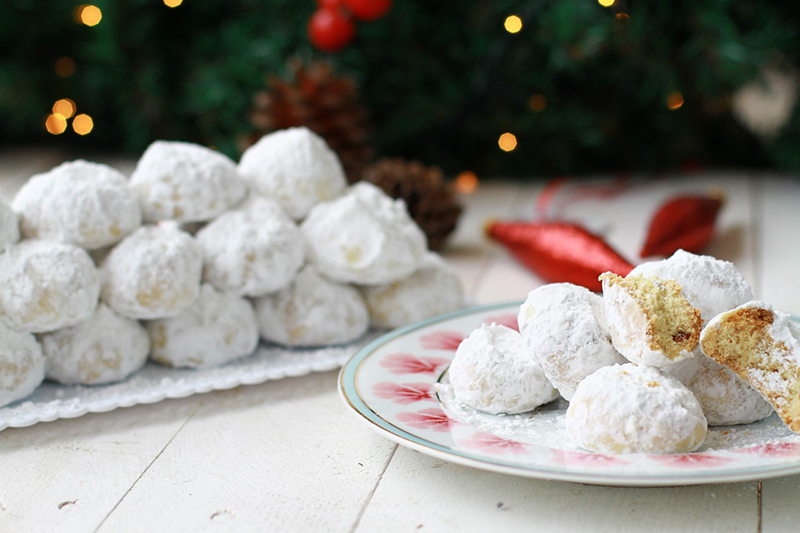 Those sweets are closely related to the Greek tradition, manners and customs of Greece. As they do not contain any fat, it is considered as a healthy option when you want to try something sweet. We can make spoon sweets with almost all fruits, after boiling the fruit and then add it to the boiling syrup with water and sugar. The spoon sweets are served in many traditional cafes and restaurants. 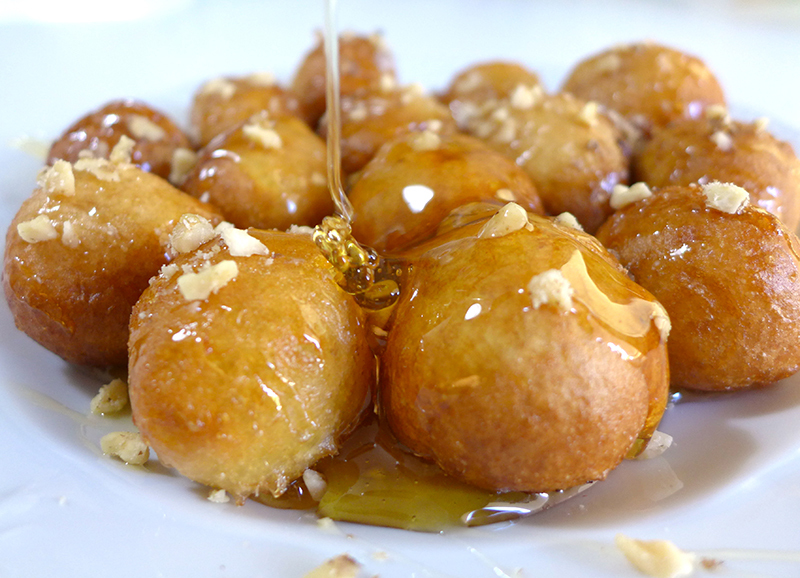 “Loukoumádes” is a popular sweet in the Balkans and the Middle East. They are made from dough, fried in hot oil. Loukoumádes are made in spherical shape, garnished with cinnamon or, sometimes, with powdered sugar. It is one of the most delicious Greek desserts and sweets and can be served dressed with chocolate or honey. Of course, those are only some of the Greek desserts and sweets that you will have the chance to taste during your holidays in Greece! Either in a tavern, after you have tasted delicious Greek dishes or in a traditional cafe, you will be treated the traditional, sweet taste of Greece.